MixCast 2.1 has officially arrived out of Beta, and it’s all about increased usability. That means new functions like instant diagnostics relay and view toggling, major improvements to UI, and even an all-new hub window to keep it all in one place. Here are some of our favourite things you can do with the new 2.1 build! Export and import configuration settings. Never spend another minute trying to recreate that perfect combination of settings from your last mixed reality session. With our new export/import function, you can save out as many configurations as you like, share them, and re-use them as you need. Manually crop out the edges of your camera view. Struggling with the physical limitations of your space? Didn’t buy enough green screen fabric at the store? We’ve got you covered. Manually crop in the edges of your feed to ensure the camera only captures what you want. Send diagnostics to our team with a click. If you ever need an expert to take a look at your setup, just press this button and our customer support team will receive all the info they need to help you out. Do everything from the new Hub. Well, almost everything. 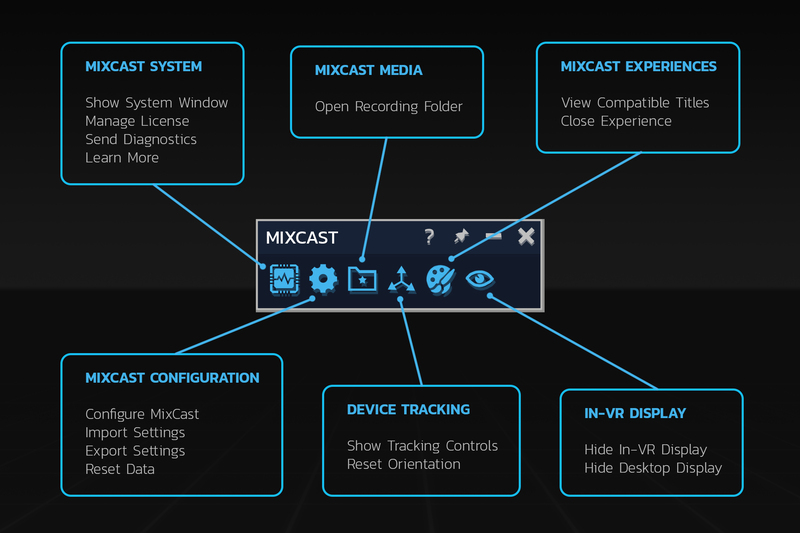 From within the MixCast Hub window, you can manage your tracking controls, toggle Desktop and In-VR displays, check in on your recordings, or reset all data and start fresh.  New Users: Download MixCast 2.1 free now!New Users: Download MixCast 2.1 free now! Current Users: Upgrade to 2.1!Current Users: Upgrade to 2.1! These are just a few of the improvements added to the huge 2.1 update; check out the full list of changes below, and ping us on Twitter and Facebook, or the official Discord to let us know how the new features are! Status Window: All-new UI hub to provide rapid access to most MixCast functions, as well as information regarding the status of MixCast. System Window: All-new UI About window to provide more detailed information about MixCast and licensing. Tracking Controls: All-new UI enabling easy room rotation. Diagnostics: Press a button instantly send all relevant diagnostics to Blueprint Reality to help resolve issues. Import/Export Settings: Save, send, and share your entire MixCast configuration. Display Toggles: Hide either the In-VR or Desktop views at any time. DeckLink Support: MixCast now fully supports all Blackmagic DeckLink capture cards. MixCast SteamVR Driver: MixCast now automatically registers a custom driver with OpenVR. This eliminates the need for extra steps when not using a 3rd controller or VIVE Tracker, in addition to making mixed reality camera tracking more accurate. Direct Window Capture: Added support for titles with non-standard window display, such as TiltBrush. This also improves the performance of MixCast with non-Gold titles. Expanded support for SteamVR titles: Added support for titles with broken alpha channels, including GORN, VRChat, Tilt Brush, and more. Click here to see a full list of compatible titles. Manual Edge Cropping: Crop your background to ensure room elements at the edge of your camera view (such as furniture, wires, or green screen edges) do not appear in your feed. Custom Object Tracking Support: Added ability to supply additional transforms to MixCast from the SDK, allowing them to be better incorporated during compositing. MSAA Support: Improved anti-alias rendering in Buffered Mode cameras.